Tomatoes are sweet and juicy summer treats. They are good to eat as is, roasted, stuffed or in salads. These fruits come in a variety of shapes, sizes and colors. The smaller ones are called either grape or cherry tomatoes. They’re the sweeter kind and are convenient to eat since they’re bite-sized. How then do you differentiate grape from cherry tomatoes? Continue reading to find out their differences. Grape tomatoes are noted to be of Southeast Asian origin. They are oblong shaped, much like their namesake – grapes. However, grape tomatoes are red. They are sweeter than the regular tomatoes. Moreover, their thick skin makes them less prone to damage. Because of that, some farmers prefer these tomatoes as they are easier to transport to different markets. Grape tomatoes stay fresh longer than cherry tomatoes. They also have a more meaty flesh. Most people prefer using these tomatoes in salads. 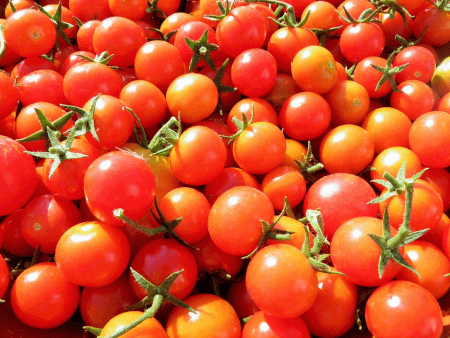 Cherry tomatoes have been cultivated since the 15th century in Aztec Mexico. They are a sweeter and bite-sized version of regular tomatoes. Their size and shape are much like cherries, hence the name. They are usually yellow, orange or red. Cherry tomatoes are a little bigger than grape tomatoes. However, cherry tomatoes are more watery and they have thinner skin. These tomatoes are mentioned to be great for stuffing. A lot of chefs are more partial to cherry tomatoes because of their flavor and texture. 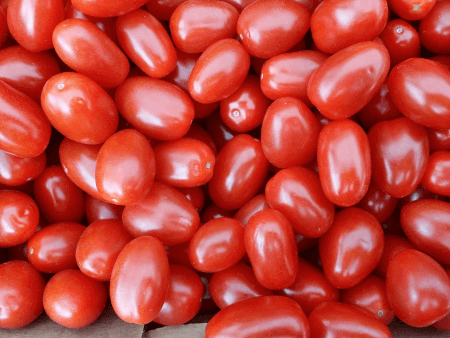 What is the difference between grape and cherry tomatoes? Grape tomatoes grow in clusters while cherry tomatoes are usually more spaced out on the vine. Usually, grape tomatoes are red but cherry tomatoes can be yellow, orange and red. Grape tomatoes have an oblong shape and are smaller than cherry tomatoes. Cherry tomatoes, on the other hand, are round shaped. Meaty flesh is characteristic of grape tomatoes compared to the more juicy quality of cherry tomatoes. Grape tomatoes have thicker skin and they stay fresh longer than cherry tomatoes, whose thinner skin leads to a shorter shelf life.